Are you looking for a Walt Disney World Vacation with all the benefits of staying on property, but far away from the busy park crowds? Well one of the original accommodations at Walt Disney World Resort is a great family escape and still going strong. Tucked back in the trees along the shores of Bay Lake Fort Wilderness Resort and Campground is still one of the most economical ways to stay at Walt Disney World, especially for those that live close enough to drive down with camp gear, or own an RV. 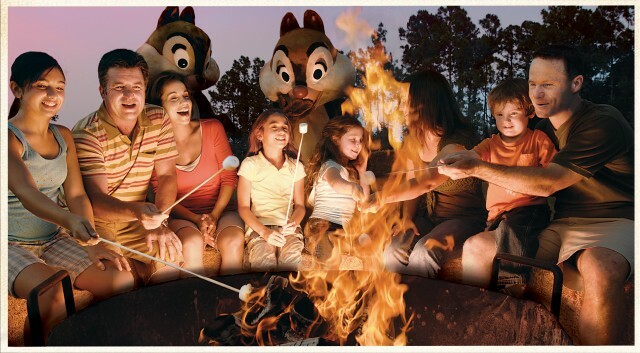 I warn you though, once you’ve gone camping at Fort Wilderness, you’ll never want to camp anywhere else again! Fort Wilderness Campsites come fully-equipped with water, cable television, and electrical hook ups, as well as a grill and picnic table. In addition the majority of sites have sewer hook up and offer high speed internet access for an additional fee. Air-conditioned comfort stations are located nearby on each loop where you will find private showers, toilets, laundry facilities, a telephone and ice machine. Or, if you don’t want to rough it quite that much, guests can call housekeeping for the arrangement of laundry services. Camp Site costs range from $40-$80 in value season depending on the location and amenities you need. A limited number of pet friendly Preferred Hook-Up and Premium campsites are available for your best friend’s enjoyment too. Recreation is in abundance at Fort Wilderness, with biking, boating, fishing, swimming, camp fires, sing-a-longs, movies under the stars, an arcade, horseback riding, carriage rides and an adventure trail! It’s an outdoor escape all it’s own that will help you create lasting memories for your family, even if you only have a few park days. Groceries, and limited camping supplies (including propane tanks) as well as sundries can be purchased at the Meadow and Settlement Trading Posts. However many guests prefer to take a trip off property to a nearby local grocery store. Some of my fondest memories as a child are of camping at the Fort Wilderness Campground where your Disney vacation meets the great outdoors. You can truly get away from it all in a premium camping environment with the added bonus of the Magic Kingdom just a boat ride away. This entry was posted on Thursday, March 29th, 2012 at 10:47 am	and is filed under Hotels, Planning. You can follow any responses to this entry through the RSS 2.0 feed. You can leave a response, or trackback from your own site.